Applesauce and whole wheat: sounds like the beginnings of a vegan breakfast, doesn’t it? Think again: those are the two key ingredients in a tasty, reduced-fat brownie recipe from King Arthur Flour. Applesauce replaces half of the butter found in a typical brownie recipe, and whole wheat flour adds fiber and nutrients. Note that I didn’t call this a lowfat brownie: it’s definitely not, as the recipe contains a whole stick of butter. But a typical American-style brownie batter for an 8″ baking pan contains two sticks of butter, so it’s definitely a lighter option. Thanks to the applesauce, the texture is dense, cakey, and very tender, akin to a moist chocolate cake rather than a fudgey-style brownie. Pecans and chocolate chips scattered atop the batter before baking help to tip the scales toward brownie and away from cake. First up will be David Lebovitz’s nonfat ginger cookies (check out the recipe here). **Notice the plate in the upper photo? It’s a Rosenthal/Continental China “Charcoal” pattern bread plate. Designed by Raymond Loewy in 1951, it’s the apex of midcentury modern design. (Loewy designed such 20th century icons as the Shell logo and the Lucky Strikes cigarette package.) My mother passed down the “Charcoal” china service to me recently; it was a wedding present from her late sister, who was also my godmother. Happy Mother’s Day! I’ve replaced some (half? more?) 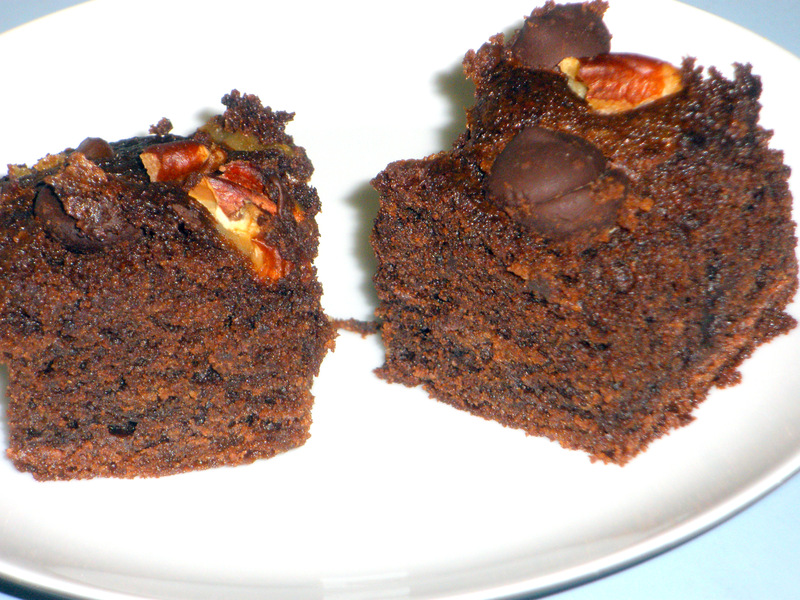 of the fat in brownie recipes with mashed overripe bananas. I like that substitute more than applesauce, because it adds flavor as well as moisture. I’ll have to try the banana substitution….I do like bananas & chocolate together. Their reduced fat brownie mix uses low fat vanilla yogurt for its base and is perfect for a girls night with those friends who like to keep things light. Even their gluten-free brownie mix is amazing and much appreciated by my gluten-free friends who usually have to pass on desserts. Ha! Every box/bag of brownie mix comes from a Trade Joe’s in Seattle, Chicago, Phoenix or San Diego from either trips that I, family or friends have made. We don’t get our TJ’s until sometime next year. Though congrats on the Costco. They do have great organic products.